The King of the Monsters! Impressive 9-inch vinyl figure based on the first-generation Godzilla. Designed and sculpted by Rampage Studios' Jon Malmstedt. Features metallic green, purple, gold, and red sprays and hand-painted detailing. 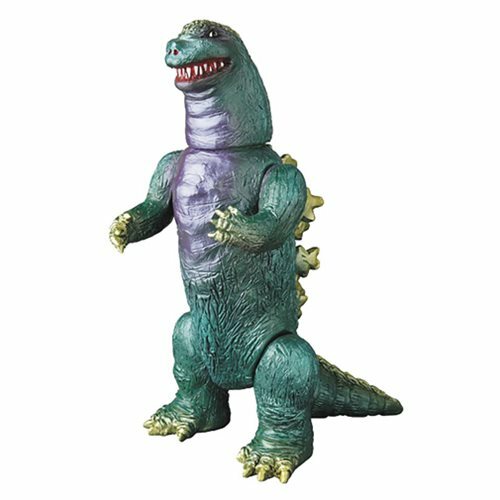 Designed and sculpted by Rampage Studios' Jon Malmstedt, based on the first-generation Godzilla, the classic kaiju is cast here in sofubi with metallic green, purple, gold, and red sprays and hand-painted detailing. The impressive Godzilla Vinyl Wars 1st Generation Vinyl Figure Rampage Studio Version features 6 points of articulation and stands approximately 9-inches tall.